Keep an eye out for Tongan second-row Big Joe Tuineau in the World Cup opener. His backstory is pretty unique. He’s a huge man at 203cm [6’8”] and 120kg [18st13lbs], and his Wikipedia entry makes note that when with the Redhawks he hit the scales at a whopping 131kg [20st9lbs]: more a blocking tight-end than a receiver, then. His college career on the gridiron was nothing to be sniffed at, but he didn’t get picked up by an NFL team in the 2008 draft, and despite trying out for the New York Football Giants, the New York Jets and the Jacksonville Jaguars as an undrafted free agent, none of them took him on board. He then returned to New Zealand and rugby, signing a contract with Southland. In 2009, he played a role in Southland’s Ranfurly Shield win against Canterbury, bringing the shield back to Invercargill for the first time in half a century. He got a fair whack of gametime in the ITN that season, and was signed up by the Otago Highlanders for the 2010 Super Rugby season. He has sort of struggled at that level since, to be honest. The big Tight End is past the linebackers and into the secondary! Still, it’s going to be interesting to see him in Tongan colours: tight-ends need good footwork and a decent pair of hands, even guys who are primarily used as an extra lineman. 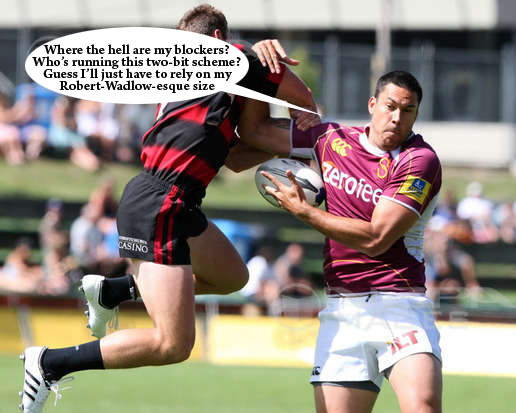 There’s not a whole heap of guys his size running around at pace with the pill in hand, even on international rugby pitches. The more obvious choice of a player to keep an out for would be Soane Tonga’uhia, the enormous Northampton prop who was the stand-out loosehead in Northern Hemisphere rugby last season. Given that we saw him humble French tighthead Nico Mas in the scrum during the Saints versus Perpignan HEC semi-final, it’ll be fascinating to see the big man go head-to-head with Kiwi Owen Franks. Franks is a talented youngster with good technique and a huge amount of strength-work behind him, but he’ll never have met anybody like Tonga’uhia. Even the likes of Tendai Mtawarira and Guthro Steenkamp aren’t built on that scale. This entry was posted in One To Watch and tagged Gridiron, Joe Tuineau, O-line Uncovered, One To Watch, RWC 2011, Soane Tonga'uhia, Tonga by dementedmole. Bookmark the permalink.